I rarely go to restaurants to eat burgers or sandwiches. I always feel like it's beneath me to order something I could easily order in Carls Jr's drive up window when I'm dining out. Which is ironic because I tend to order appetizer combos instead of an actual entree. And appetizer combos are two steps lower on the bachelor food pyramid than a juicy burger. 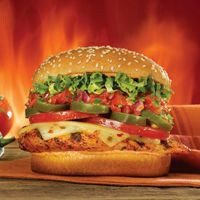 Enter the new 5 Alarm Chicken Sandwich from Red Robin. You may already be familiar with the tasty 5 Alarm Burger, but Red Robin is offering this and a few other new specialty items until the end of July. This sandwich boasts "a spicy combination of grilled chicken breast, spicy Pepper-Jack cheese, jalapeños, tangy salsa and homemade chipotle mayo." Maybe it's because I'm just leaving work, but that is sounding pretty tasty right now. In short, it's not the best chicken sandwich I've ever had. It's not even all that spicy. You think the jalapenos would help with that, but they've almost been absorbed by the salsa. Personally I wanted to bite into this sandwich and instantly regret it as I taste hellfire and even feel it burning my insides. But sadly it's just not that hot. For the price and taste the 5 Alarm Chicken Sandwich is hard to beat and is a very reasonable lunch purchase (because we all know chicken sandwiches will not keep you satisfied at dinner). They are especially good if you have a $10 gift card. What I really want to know is how long you spent eating basketful after basketful of bottomless fries?? Do you think they'd care if I fed my family on just the bottomless fries? Had a burger there with so many fat balls that it made me gag.